Unsure of the proper procedure and not wanting to hinder a government department, the couple allowed the three men into their home. Next, one of the men asked Mr. Smith to lead him to the basement while a second man started up a meaningless conversation with Mrs. Smith. The remaining man impersonating a water department employee went into the master bedroom and stole more than $2,000 worth of cash, jewelry, and other items. He was able to do this within minutes. In fact, he completed his crime and exited the house before Mrs. Smith’s conversation ended. The Smiths did not realize any of their belongings were missing until the next day. In Kenosha, Water utility workers are required to wear lanyards on their person visibly identifying themselves. Whether the scammers use utility companies as a front or someone asks for money because they lie about running out of gas in a parking lot, common sense and awareness are a potential victim’s greatest assets. Call the police. This is particularly effective for stopping fraudulent door-to-door solicitations. Report Internet phishing to the real company. Because scammers often pose as legitimate businesses such as banks, credit card companies, and online merchants, many of these companies offer ways to report scams. Report the scam to the Federal Trade Commission (FTC). The FTC lets you report scams of all kinds. Forward anything you consider deceptive, including spam, chain letters, and phishing emails, to spam@uce.gov. Report charity scams to the actual charity. If you suspect someone is committing charity fraud, call the real organization. Verify the person’s affiliation with the charity, and make sure the organization is raising funds in the same way as this person — for example, by phone, door-to-door, email, etc. Report scams to the Better Business Bureau. This gives other people the opportunity to check on these charities and companies. Never send money to receive money, as in the case of lottery scams. Whether the scam originates by mail, Internet, or telephone, prevention is the key. Many of the scams involve perpetrators who live out of state, or even out of the country. It is very difficult to track the suspects down to investigate, so we educate to prevent the scam from happening in the first place. However, in any scam where you are contacted in person, like the water department story above, please call the police. We also ask that you be a good witness by providing suspect and vehicle descriptions. 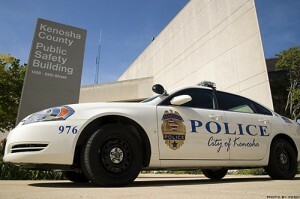 Jeff Wamboldt and Ron Francis are Kenosha Police Department Crime Prevention Officers. To inquire about Neighborhood Watch and other safety programs, contact them at (262) 657-3937, or e-mail watch@kenoshapolice.com.